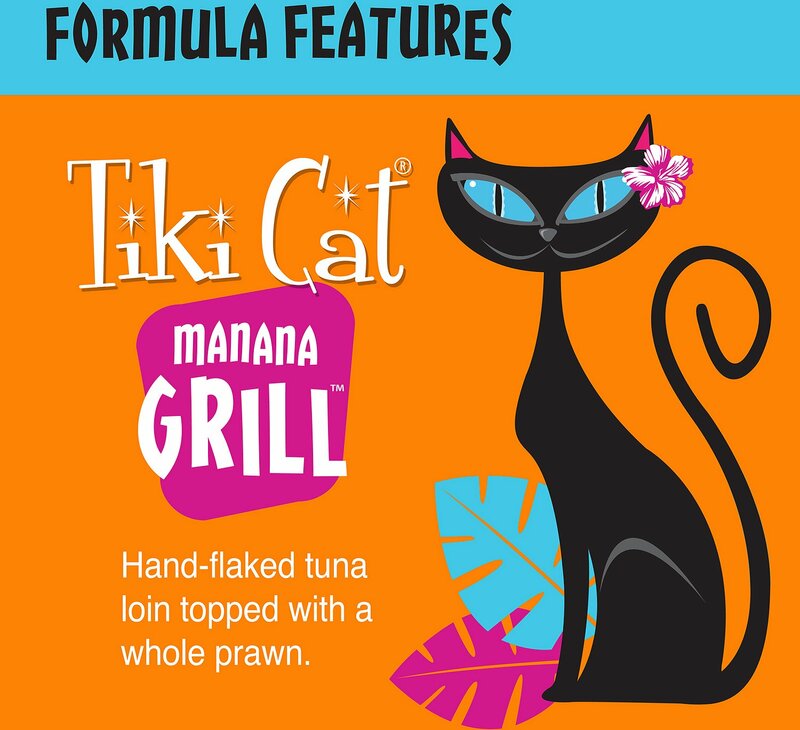 Bring some fresh-from-the-sea nutrition to your kitty’s bowl with the Tiki Cat Manana Grill Ahi Tuna with Prawns in Tuna Consomme Grain-Free Canned Cat Food. 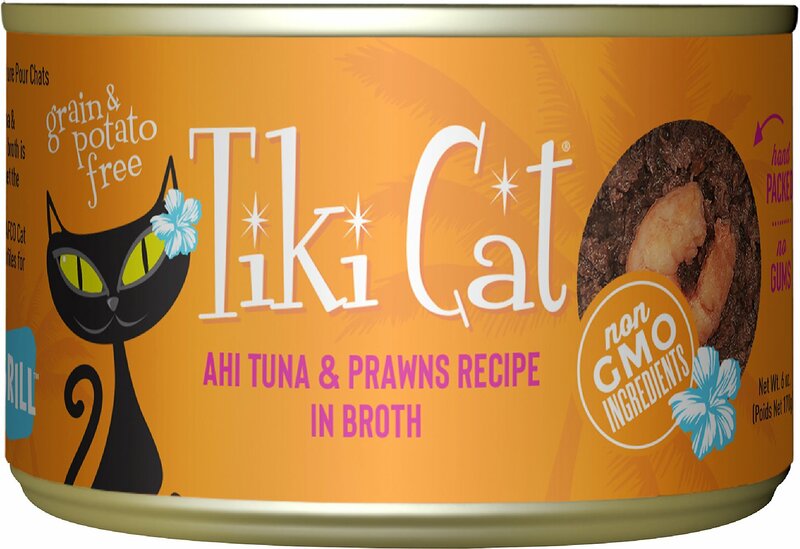 It’s a luau of flavors purr-fectly fit for your furry carnivore, with wild-caught flaked Ahi tuna topped with succulent wild baby prawns, and simmered in a tasty tuna consomme. Since it’s made with actual broth, it provides plenty of moisture to keep your pal hydrated and support digestive and urinary health. And it’s packed with essential vitamins, omegas, minerals and taurine so it’s a complete and balanced diet for cats of all ages, with zero grains, gluten, carbohydrates, starches or flours. Wild-caught flaked Ahi tuna and wild baby prawns as the top ingredients for animal-sourced protein to meet the nutritional needs of carnivores. High protein to support healthy muscles plus sunflower and tuna oils rich in omegas that nourish the skin and coat. Made with real tuna broth so it provides essential moisture to keep your pal hydrated and support overall health. Luxurious consomme-based formula is great for picky eaters, and contains no grains, gluten, carbohydrates, starches or flours; made with dolphin-safe fish. Because of diabetes issues, my 14-year-old cat needs to eat as carb-free as possible. (We are managing her diabetes without meds.) This cat food fills the bill. It's wonderful to have a food source like this. Best of all, she loves it! My cats eat tiki cat chicken but recently seemed to be off it. I tried this and although my picky house cats didn’t like it, my outside feral colony loved it. The food itself is nice, looks edible for humans and isn’t smelly at all. A bit of breaking it up with a spoon, and it’s perfect for small kitty mouths. 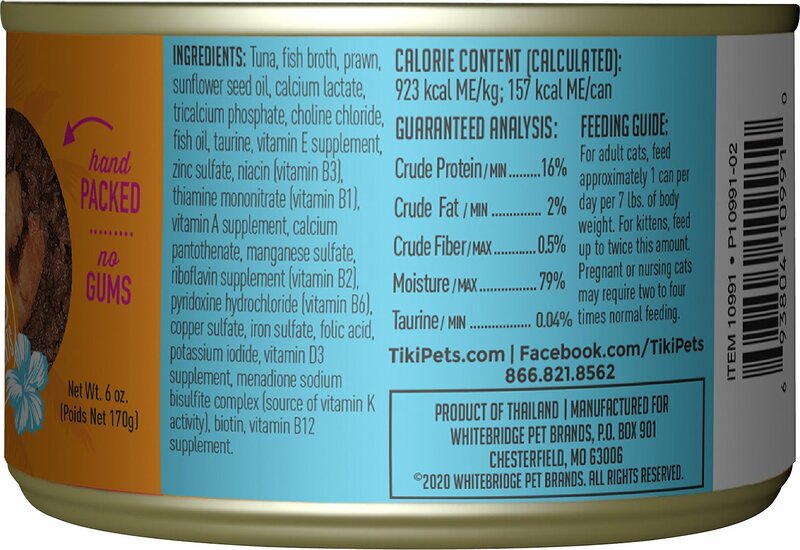 All the tiki cat products are wonderful, good quality and grain free. Some reviewers claim the chunks are too big but just break them with a spoon. I mean, it’s for cats not kids. Maybe it's the texture as she is accustomed to pate, but she wouldn't even touch it. Several cans will be donated to the local shelter. I guess! Lesson learned....don't buy more than 1 can of a new product! Cats go crazy for this food. There are actually small whole “prawns”, more like little shrimp, on top of the tuna, but the cats love it so shrimp or prawns who cares. 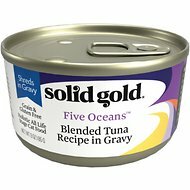 I have a cat in end-stage heart disease who has become finicky about what he eats. He'll like a food for a few days and then stop eating but he's loved the Tiki Cat food except this flavor! I gave it four stars because I really like that I can see the meat in the food and because my other cats liked it but I'll go back to buying the variety packs for my picky kitty. So I got this pdf spreadsheet of different cat foods and their level of protein, phosphorus and calories. I use it because my 13 year old cat has beginning renal issues. You're supposed to feed them a diet low in phosphorus and high in protein. These tiki cat food cans have both. They seem like quality cat food but my cat doesn't want to eat it unfortunately. All Three Cats Love It! All of my babies love it- after the first breakfast with this particular flavor, they woke me up an hour early the next day in an attempt to get their breakfast earlier haha! Sadly, there are normally only 2 prawns per 6oz can but I have gotten one can with 3 before. All of the tiki cat flavors have been winners with my kitties I would definitely recommend! I have 6 cats and they didn't eat it like I thought they would. 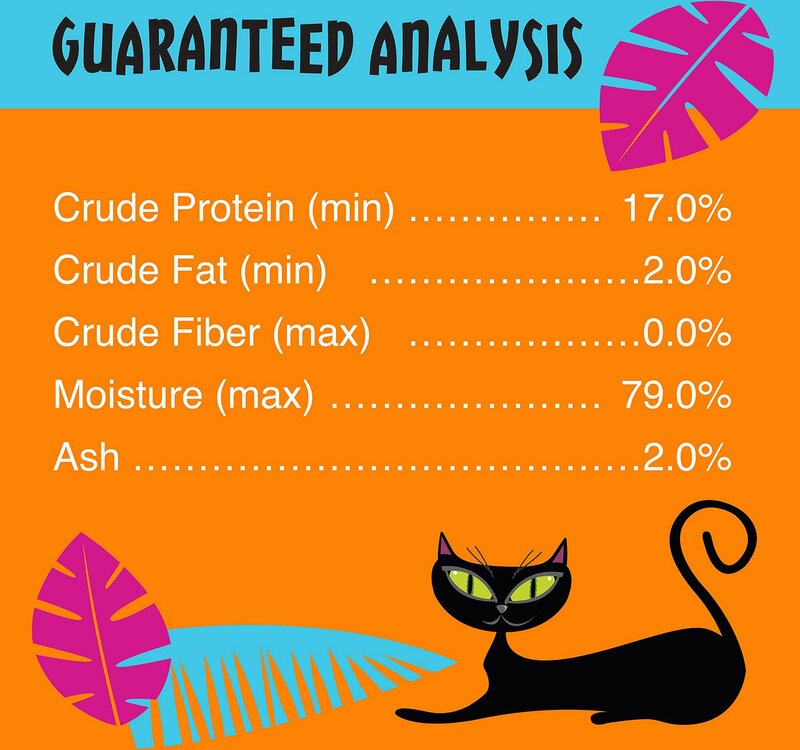 My cat Otto is pre diabetic and the prescription food was just to expensive so I thought I would try tiki as it has the largest percentage of protein. He loves it!! !